Origin of "Kung-Fu : The World's Number One Martial Art"
The Chinese history says that the Indian monk Bodhidharma (also Ta-Mo) is the founder of Chinese boxing (Kung Fu or Wushu). Bodhidharma was the 28. Successor Buddhas and the son of king Suganchas from Kanshipuarm. 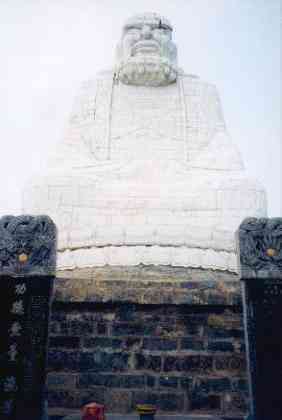 527 A.D. Bodhidharma came as a student of Prajnatara to China where he settled down in the legendary Shaolin temple. He met a majority of monks around himself and spread the buddhistic theory of Chan. Bodhidharma developed the 18 boxing techniques of Shaolin, which is trained by the monks because their body condition was rather bad because of long meditation. The exercises should enhance the health of the monks, which energize the internal organs and steel their muscles, so that they are able to live longer. Bodhidharma medititated quiet-sitting in a small cave above the Shaolin Temple nine years in front of a wall. During his meditation for so many years the sun burned his outlines into a stone, which can be be visited in Shaolin. 621 A.D. the Shaolin monks fought their first battle. At the beginning of the Tang-dynasty an embittered fight raved between left Shimin, a north Chinese aristocrat whose father was the founder of the Tang-dynasty and a general of the Sui dynasty, Wang Shigong. Li Shimin had heard of the martial arts of the Shaolin monks and asked them fighting against Wang Shigong. The monks consented and drove in the famous battle of Qianglingkou the troops of the Shigong back. Shimin was crowned and was very generous with Shaolin monks. The Shaolin monk Tang Zong was appointed to a general and the temple received over 40 hectares field. Furthermore the Shaolin Temple got the permission for educating its own army. The term "Fighting Monk" was born and the monks of the Shaolin Temple had reached high reputation in whole China. Shaolin Temple was built in 495 A.D. by an Indian monk named Ba Tuo in the Songshan mountains in the province Henan. In the Ming dynasty (1368 -1644) the Shaolin Kung Fu experienced an enormous upswing. 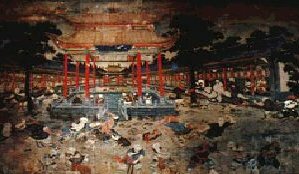 The army of the temple was now 2500 men, and the Kung Fu of the temple was exercised in innumerable variants and techniques. The government of the Ming dynasty promoted the Shaolin Kung Fu in all possible forms. Thus weapon techniques, Chi gong, Meditation and all well-known fist forms became the daily trainings program of the monks. And again it was a political change which helped the Shaolin Kung Fu in its development. In the Quing dynasty 1644 - 1911 all combat arts were forbidden and many monks left the monastery. But the Quing dynasty reached exactly the opposite. The old art of the Shaolin Kung Fu with their various kinds became still more comprehensive and more completed. The monks which protracted into the whole country, in order to spread Buddhism saw many new kinds of martial arts, wrote these down and brought these back into the temple. Therefore new styles with new techniques were created and integrated into the existing Shaolin Kung Fu. Till today the Shaolin Kung Fu is the largest and most well-known martial art in China. A Chinese dialect says: "All styles of Kung Fu come from Shaolin, but the Shaolin Kung Fu is the best one."